When your business requires work or supplies from outside companies, the success of your company depends on refining your request for proposal (RFP) process. Without an effective RFP process in place, you’ll spend extra time and money finding companies that can do the work outside your company’s capability. If you follow an efficient RFP process, you’ll be well ahead of your competitors in attracting businesses that want to work with you. A request for proposal is a document that solicits proposals from outside organizations or contractors to provide a commodity or service. Examples of RFPs include retail businesses soliciting ad agencies to create advertising campaigns, nonprofit organizations seeking assistance with grant writing, and government organizations requesting proposals from contractors for municipal building construction. Because there is a wide range of applications for the RFP process, there is no exact formula for success in every setting. 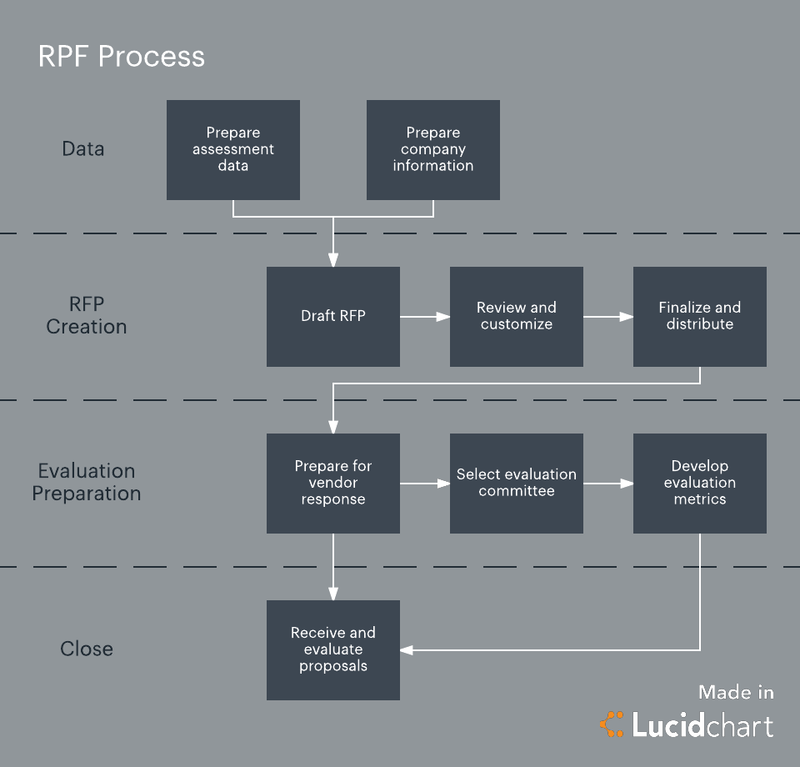 While there is no foolproof formula, following the request for proposal steps outlined below will set you on the right track—especially because you can customize each step for your particular organization, using Lucidchart to visualize and document your specific workflow along the way. The first of the request for proposal process steps is to establish the team responsible for the RFP. This team should include key stakeholders, the person who will actually draft the RFP, the parties who will review the RFP. The project manager makes sure the RFP process stays on track, meets deadlines, and avoids potential roadblocks. After assembling your team, bring everyone together to establish a timeline for the RFP process—when any necessary research should be done, when the first RFP draft should be completed, when key stakeholders need to review the draft, when the final RFP should be sent out, and when you should stop taking responses. Use Lucidchart to document the timeline and request for proposal process flow for everyone to see. Like any professional document, your RFP should include an introduction that lays a foundation for the request to follow while also quickly summarizing what the reader will find in the rest of the document. Explain who you are as an organization, what you want to achieve with the RFP, and provide a summary of the work needed in a few main points, including the due date for proposals. Companies that see the RFP and are interested in providing products or services will read on, and those companies with products or services that don’t apply will know to stop reading. Provide background on your organization, your goals, and similar projects you have done in the past. This section will give potential contractors an idea of who you are and what you stand for. Also include contact information and background information about the people at your company who will be reviewing proposals. Now explain what work you need done or products you need to obtain. If you’re doing an RFP for services, you’ll want to include a scope of work detailing specific duties to be performed and the expected outcomes. Here you detail the information you require in submitted proposals. This section is basically an instruction manual for companies that will respond to your RFP, telling them your preferred response method. This section outlines what your business expects from vendors in terms of communication, price, timely work, and other important factors that can help to weed out lackluster proposals. By including information on your available budget, you may also narrow down potential clients who work at higher price points. Explain clearly in your request for proposal the criteria used to determine the winning bidder. With this explanation, you will receive better, more targeted proposals—and it will make your decision process easier if vendors do not meet these criteria. Necessary timelines include not only the due date for proposals but also due dates by which a contract must be signed and when work or supplies should be delivered. You may also want to include a payment schedule that works for your business. You can use Lucidchart to design a timeline (similar to the template shown above) for deliverables. Once you have completed the RFP and reviewed it with all key stakeholders, distribute it to potential respondents. Currently, the recommended way is to create a project web page that houses all the relevant information, including a downloadable version of your RFP documents. Send out an email providing a broad overview to potential vendors, and link to the project webpage containing the more detailed RFP. Be sure to include relevant deadlines and return contact info in all correspondence. If you’ve followed the process up to this point, the responses should be pouring in. It’s time to review the proposals you’ve received. Using the criteria you detailed in your RFP, set up a scoring system related to your particular project, including price, to evaluate responses. Once you’ve narrowed it down to two or three potential vendors by evaluating their proposals, you’ll probably want to meet in person to get a better feel for each service provider and further narrow down your choice. Selecting a vendor is not the end of the process. Once you have found the best fit from the proposals and meetings, you still need to negotiate terms—not only price, but also deliverables and timelines—and come to a final agreement with a contract. Until both sides have agreed on a contract, the request for proposal process is not over. You might have to go back to the previous step if you can’t agree to terms. Once the proverbial dotted lines have been signed, though, the process is concluded and the vendor relationship begins. Throughout the entirety of the request for proposal process, you’ll want to keep everything properly documented and organized—and as you’re writing the RFP itself, include charts and diagrams that demonstrate what your company is looking for. Sign up for a free account and use Lucidchart to create the flowcharts, checklists, and more to make your RFP process run more smoothly than ever before.